Get on down to the racetrack for an exciting day of horse-fuelled madness! Click here to play! There is plenty to be won for those who enjoy a wager, with more than one horse on the field hailed as a Sure Win. This fun slot is played across 5 reels and 25 pay lines, with the more lines activated giving you a greater chance of big payouts on winning combinations. After any win on the reels you will be offered the chance to gamble your payout for extra money; just select the color or suit of the card to win! 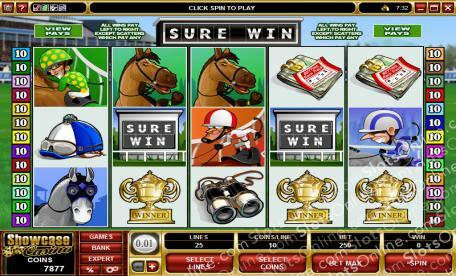 The Sure Win logo is Wild and triples your payout when substituted into a winning combination. If you earn all five in one go you will win yourself up to 7000 times your initial wager, and the only symbol that the Wild can be substituted for is a Scatter. The Bookie is Scattered and not only pays out at odds of up to 100:1, but if you manage to spin up three or more you will activate the free spins bonus game. Take your pick of the winners and starting playing Sure Win today! The Bookie is Scattered and when three or more appear on the reels the free spins bonus is activated. Additionally, if you spin up all five you will also receive 100 times your bet. The Sure Win symbol is Wild and can be substituted for any other symbol on the reels except Scatters. Every time the Sure Win symbol is subbed into a combo the payout will be triple! Earn three or more Scattered Bookies for the free spin bonus which can earn you a stack of cash in no time!